We live in a world where the public often judges architectural merit on pure aesthetic. Architecture as an art undoubtedly contributes to our cultural capital, and expertise within the field is a valuable tool. Yet, great architectural design results not just from the art associated with the aesthetic, but how well the building supports its occupants. When it comes to designing schools for children with autism, art and experience are no longer enough. Even the most well-meaning designer looking to inspire creativity or foster positive feelings must re-examine what it means to be empathetic in design. In this case, the best way to be empathetic is to reduce assumptions and be as open-minded as possible. An empathetic person traditionally may practice active listening, asking questions, and looking to connect to the feelings of another person. This all makes sense in a situation where the architect and the building’s users are neuro-typical functioning individuals, and the largest hurdles may be overcome through discourse and further clarification. When it comes to designing for children with autism, we must overcome communication challenges while simultaneously accounting for the fact that the child’s sensory experience is vastly abstracted and magnified in comparison to the neuro-typical adult. White may become blinding; green may become red; and a simple wall sign may become the difference between a successful and unsuccessful trip to the bathroom. Between the communication barrier and differing experience of the world all-together, achieving an empathetic design must look to additional methods to cater to these users. 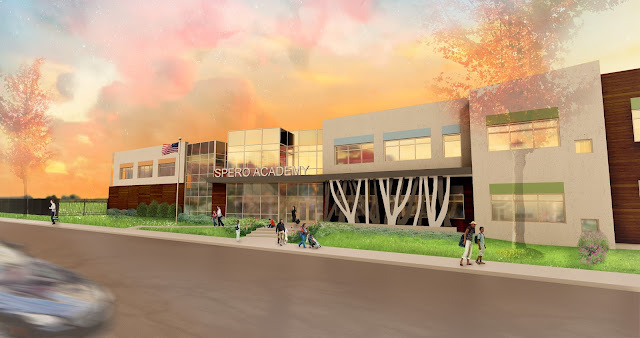 Spero Academy, located in Minneapolis, Minnesota, provides a safe space for students with autism to build confidence — a place to learn how to regulate and manage their emotions, behaviors, and disorders so they can experience the type of accomplishment that so many take for granted. The school provides a national model of tailored education for children with special needs. In 2018, a newly constructed building will help accommodate planned programming expansion intended to meet growing demand for the Academy’s services, replacing a small rented space just a few blocks away. The new 64,000-square-foot school building will house 21 classrooms, a gymnasium, cafeteria, kitchen, administration, and various specialist rooms. As our team began the planning phase of this new home for Spero Academy, one of our highest priorities was to ensure we upheld an empathetic approach to design decisions large and small. To accomplish this, we needed to understand how students process and respond to the sensory environment to the best of our ability. We knew it would not be possible to customize a school to fit each individual’s specific needs, because each student is unique and copes and responds to the sensory environment in different ways. We did know, however, that the physical spaces where students learn have an active role in shaping their experience and that certain design strategies have been found to have an effect on student learning and behavior (Khare, 2010; Khare & Mullick, 2009; Mostafa, 2008; Yates, 2017). This drove us to seek out more specific research and recommendations on designing for autism and to speak to educators to glean their insights into the needs of students at Spero Academy. A focus group was held with 10 educators, including classroom teachers, a music therapist, speech therapists, occupational therapists, and a behavioral specialist. Questions included probes into the specific behavioral, educational and environmental challenges each participant faced in the current building and what environmental qualities their ideal learning or therapy environments would embody in the new space. Their insights and recommendations were then vetted with the research recommendations that were uncovered in order to determine what would be included in the proposed design. While many of the specific strategies identified from the research require more research to determine effectiveness, our team was able to uncover several expert theories and recommendations on which to formulate our design. One of the first sets of theories we uncovered was the sensory-sensitive and neuro-typical approaches to designing environments for students with autism. Of the two theories, the sensory-sensitive approach is the approach most typically employed and studied regarding design for the autistic population. It involves tailoring an environment to best accommodate the needs and sensitivities of students with autism. However, we also uncovered several advocates of the neuro-typical approach. This is essentially the philosophy that children with autism should experience “typical” environments for all activities, including education, with the hypothesis that it will help with overall integration into society. There are strong arguments for each approach, but, as of now, there are no definitive studies comparing the sensory sensitive approach to the neuro-typical approach (Mostafa, 2008, Henry, 2011). Henry (2011) concludes that the best approach to designing for students with autism may be a combination of both theories. While our initial design philosophy for the new Spero Academy building primarily followed the recommendations of the sensory-sensitive approach, our design team has ultimately integrated strategies from both neuro-typical and sensory-sensitive theories into the design where deemed appropriate. Many of these theories were inspired by “Interior Design for Autism” written by A.J. Paron-Wildes. Below are just five of many different ways these approaches are being realized in the final design. First impressions are very important, especially for charter schools, where students and parents have the choice whether or not they want to enroll. Parents visiting the school have to determine if this is the right school for their child to spend nearly every day for the next few years of their life; therefore, creating an inviting and comfortable entry sequence is crucial for Spero Academy to realize their growth goals in Minneapolis. As a result, the entry sequence follows a neuro-typical design approach, creating a sense of familiarity. The exterior design is warm, inviting, and playful. We wanted the school to look like a school and inspire excitement for the students and comfort for parents. The design of the main entrance includes a two-story space with ample exterior glazing to create an open space and bring daylight and nature into the space, creating a welcoming and comfortable environment for parents and visitors, without hindering the students’ ability to focus and learn. The overall floor plan of the school was inspired by a sensory-sensitive design consideration which suggests that children with autism tend to be more comfortable in spaces zoned according to “high-stimulus” and “low-stimulus” qualities (sensory zoning) as opposed to those zoned by function of space (functional zoning). By distinctly separating high-stimulus zones from low-stimulus zones with transition zones in between, children are able to recalibrate their senses as they move from one zone to the next. To design for the student population at Spero Academy, we divided the school into sensory zones, separating the high-stimulus, low-focus areas such as the gym, cafeteria, entrance, and gathering areas from the high-focus, low-stimulus zones such as the classrooms, media lab, speech room, specialist rooms, and restrooms. Sensory zoning occurs in the classrooms as well. Each activity within the classroom is allocated to a “station” that is physically distinguished from other areas of the room through changes in furniture, flooring and lighting levels appropriate to the “station’s” function. Lighting is another important consideration. In addition to substantial natural daylight with window shades to adjust natural light levels, the overhead lighting plays an important role in creating a sensory sensitive environment. Similar to many schools, classroom lights are on occupancy sensors. However, lights must be manually turned on upon entering the room. In Spero Academy’s current school, many teachers do not use overhead lights at all, rather they use only natural daylight or a combination of lamps and natural light. Giving the teachers the ability upon entering the classroom to leave the lights turned off creates a calming affect for the students. Individuals with autism can be hyper-sensitive to color or light intensity, so bright color and sharp contrast can be distracting or disorienting. Reinforcing spatial zoning, the high focus, low-stimulus areas have soft natural light and a subdued color palette and that is calming and comfortable, avoiding over-stimulating or vibrant colors. In contrast, the high-stimulus, low focus areas utilize larger expanses of natural light and a slightly more vibrant color palette, while still ensuring the colors are not overly stimulating. A final consideration that relates to both neuro-typical and sensory-sensitive environments is the importance of using non-toxic chemicals in furniture, equipment, and building materials and eliminating off-gassing to the greatest extent possible. Children with autism can be more susceptible to toxic chemicals due to a weakened immune system, so eliminating the exposure of chemicals to the greatest extent possible can prevent medical and behavioral problems. The new school will begin construction in the coming months. While we know there’s still much to learn when it comes to designing spaces for children with autism, the supporting research and design strategies integrated into the planning and design of the new school give us confidence that the school will be a safe, comfortable, and inviting learning environment for students to learn, grow, and succeed. Students of Spero Academy deserve to experience successes in school and in life just as much as everyone else. Our goal was to combine art, science and empathy to design a new building that will provide opportunities for success for current students and many more within the community. Bethany DeLine is a designer at HDR, and human advocate, an eclectic creative and an impassioned creator of happy places. Bethany Friedow is a researcher at HDR who brings a unique skillset, with strengths in both design and research and an innate curiosity which drives her work and allows her to focus on cultivating a greater understanding of how design impacts health, wellness and user experience. Brian Giebink is an architect at HDR dedicated to creating safe, healthy, empowering environments for children and adults in healthcare and education settings. His leadership in behavioral and mental health design inspires a unique approach to school design for students with special needs. Paron-Wildes, A.J. (2014). Interior Design for Autism: From Childhood to Adolescence. Hoboken, New Jersey, John Wiley & Sons, Inc.
Yates, M. K. (2017). Building Better Schools: A New Model for Autism Inclusion in Seattle (Doctoral dissertation). Khare, R. (2010). Designing inclusive educational spaces for autism. Institute for Human Centered Design. Khare, R., & Mullick, A. (2009, October). Designing inclusive educational spaces with reference to autism. In Proceedings of the Human Factors and Ergonomics Society Annual Meeting (Vol. 53, No. 8, pp. 517-520). Sage CA: Los Angeles, CA: SAGE Publications. Mostafa, M. (2008). An architecture for autism: Concepts of design intervention for the autistic user. International Journal of Architectural Research, 2(1), 189-211.